A good night's sleep tends to leave you feeling refreshed, alert, and upbeat. According to a new study, it may also make you look healthier and more attractive to others. 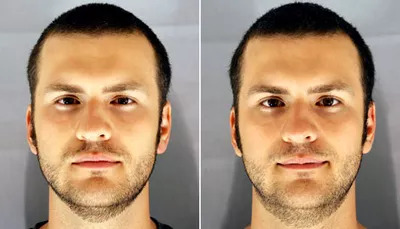 People tend to look less attractive and healthy when sleep-deprived (left) than when well-rested (right), a new study shows. TUESDAY, December 14 (Health.com) — A good night's sleep tends to leave you feeling refreshed, alert, and upbeat. According to a new study, it may also make you look healthier and more attractive to others. When the researchers mixed up all the photos and asked 65 people to rate how attractive, tired, and healthy the study participants looked, the photographs of the well-rested people scored significantly higher. Compared to their well-rested selves, the sleep-deprived people were judged to look 19% more tired, 6% less healthy, and 4% less attractive. "Sleep is a cheap and effective 'beauty treatment,'" says the lead author of the study, John Axelsson, PhD, an associate professor of clinical neuroscience at the Karolinska Institutet, in Stockholm. "In fact, sleep should be seen as the body's natural beauty treatment and a preferred alternative or complement to other beauty treatments." While that 4% decline in attractiveness may not seem like a lot, it can make a big difference in everyday life, Axelsson says. Looking healthy and well-rested "improves the chances of better treatments in a wide range of social situations," he says. "It is well known that attractive people are favorably treated in many situations." Sleep deprivation can indeed have an impact on a person's features, says Donna Arand, PhD, the clinical director of the Kettering Sleep Disorders Center, in Dayton. "People's eyes don't seem to be open quite as wide, the muscles in their face are more drawn or relaxed," Arand says. "Sleep does help restore muscle tone and repair the physiological degradation that occurs after being up for 16 hours going through your normal day." The study findings make sense biologically, says Donald Greenblatt, MD, director of the Strong Sleep Disorders Clinic at the University of Rochester Medical Center, in New York. When we sleep, our perspiration "naturally moisturizes" our skin, and lying down increases "blood flow to the face, so wrinkles are going to be less apparent, at least temporarily," he says. And the body secretes more human growth hormone (HGH) during deep sleep, which may somehow contribute to a more rested, youthful appearance. "There's something about HGH that helps the body repair itself," Dr. Greenblatt says. According to Axelsson, potential mates may be hard-wired to respond to these subtle changes. Humans may have evolved "an ability to detect sleep-related cues" that "is likely to affect mate preferences," he says. "It has been proposed that facial cues perceived as attractive are signals of good health that have been selected evolutionary to guide mate choice and successful transmission of genes."